FESTIVE CHEER ALERT! Our lovely staff have decided to support two great causes this Christmas. Firstly we are collecting for local children's hospice Julia's House https://www.juliashouse.org/get-involved by donating to support their great work instead of sending Christmas cards and Inoplas will match all contributions. 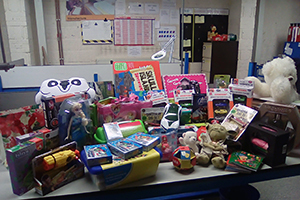 Secondly, a new one for us, Inoplas has signed up as a collecting hub for Wave105's fabulous Mission Christmas http://www.wave105.com/charity/mission-christmas/ and we are collecting new and unwrapped gifts suitable for disadvantaged local children and young people aged 0-18 years. If you are able to help please drop in with your gift and we will do the rest. We already have a fabulous collection ready to deliver (pictured). Well done to our charities team Allison and Magda for sorting this all out!